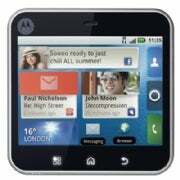 Motorola's Milestone XT720: Is This The Next Droid? Motorola proved the rumor mill right on Wednesday when it introduced the square-shaped, Android-based Flipout phone featuring Motorola's enhanced Motoblur overlay. The device had previously leaked online through Gizmodo Brazil , and Wednesday's announcement was pretty much what was expected. The Flipout is running Android 2.1, will be Adobe Flash enabled and Microsoft Exchange capable. 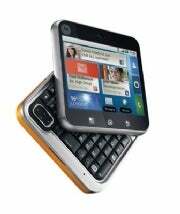 Other specs include a 2.8-inch screen with 320 x 240 resolution, QWERTY keyboard, GPS, Wi-Fi and Bluetooth connectivity, and a 3 megapixel camera with digital zoom. For storage, the Flipout includes 512 MB of internal memory and a 2GB SD card--expandable up to 32GB. The Flipout's enhanced Motoblur feature will sync your contacts, e-mail and social networking updates into one interface, and will also keep an online back-up of your information. No pricing details were announced. The Flipout will launch in Europe in the coming weeks, but there's no word on a U.S. launch date. In fact, it's not clear if Motorola will launch this device in the U.S. at all. If Motorola did decide to pass on a U.S. launch, it would be a little surprising given that the Flipout sounds like it could be Motorola's version of the recently-announced Microsoft Kin phones . Small and compact devices that are basically entry-level smartphones, such as the Kin and the Sidekick before that, have proven to be popular with American users and the novelty of the Flipout alone could drive sales. I've reached out to Motorola to see what the company's U.S. plans are for the Flipout, and will update this post when I hear back.